This is a photo I made in front of Stephen King’s house in Bangor, Maine. About two months ago we wrote about Tel Dor here. The day before that we noted the discovery of the miniature carving of Alexander the Great here. Paula Waiman, a PhD student at the University of Haifa, left a comment on the post about the Alexander carving. Her advisor is Dr. Ayelet Gilboa, co-director of the Tel Dor Excavation. I suggested to her that we move up her comment so it would be easier for readers to see. The exquisite gemstone of Alexander the great that captured your attention, as seen in you website, is only the tip of the iceberg, so to speak, of one of the largest, long lasting and high profile archaeological projects in Israel. If you care about the archaeology of biblical times (Israelites, Phoenicians and Sea People), the Classical periods, and the cultural heritage of Israel and the Mediterranean; and if you are interested in forging a bond between Israel and the international community – please take a moment to look at the attached file [see Tel Dor website for full info]. Like almost cultural projects around the globe, we need your help to endure. Tel Dor has also a facebook wall. You are welcome to visit us. Prof. Sarah Stroup, University of Washington, has posted some nice photos of the excavation here. A new blog, called The Tel Burna Excavation Project, has been launched to report on the preliminary survey of Tel Burna. The tel is located in the Shephelah of Israel among such sites as es-Safi/Gath, Zayit, Goded, Mareshah, Azekah and Lachish. The Shephelah. Map: Tel Burna Excavation Project. In the case of Tel Burna, with no excavation material available, the problem is even more difficult. despite this, several scholars have suggested identifying the site with Biblical Libnah (although one should note that nearby Tel Zayit is a very likely candidate as well – as Ron Tappy, the excavator there, has recently published). Libnah was a Canaanite town that was conquered by Joshua who allotted it to the tribe of Judah (Joshua 10:29-30; 15:42). The city was chosen as one of the Levitical cities (Joshua 21:13), which points to its role as a border site. According to 2 Kings 8:22 (and 2 Chronicles 21:10), the city of Libnah was involved in the rebellion against Jehoram the king of Judah (in 9th century BCE) and later, a woman from Libnah married King Josiah in the 7th century BCE (Kings 23:31-32;2 Kings 24:17-18; Jeremiah 22:11). 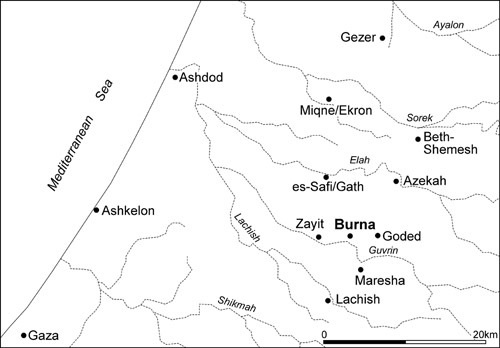 In any case, even if the site is not Libnah, it is clear for the survey results (which will be mentioned in an upcoming post) that the site was a very important site in the Iron Age, along the border between Judah and the Philistines. HT: Luke Chandler’s Blog; Aren Maeir. 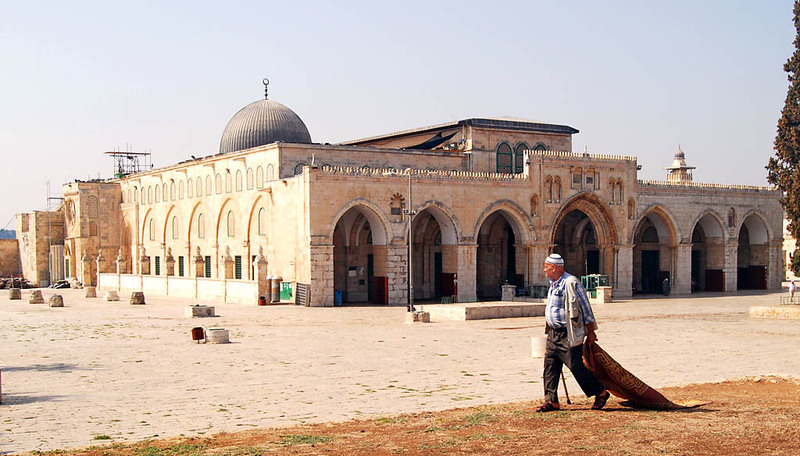 The Al-Aqsa (or Al-Aksa) Mosque is one of the two important buildings erected by Moslems on the platform built by Herod the Great. A Brief Guide to the Dome of the Rock and Al-Haram Al-Sharif, published in 1965, says the Al-Aksa Mosque was built in A.D. 693 or A.D. 705. The other significant building on the platform is called The Dome of the Rock or the Mosque of Omar. It is built over the rock where, according to tradition, Abraham offered Isaac (Genesis 22), and where the Temple of Solomon once stood (1 Kings 6). Palestinians clash with Israeli troops at al-Aqsa mosque in Jerusalem. Demonstrations at holy shrine erupt into violence as youths fight battles with riot police. 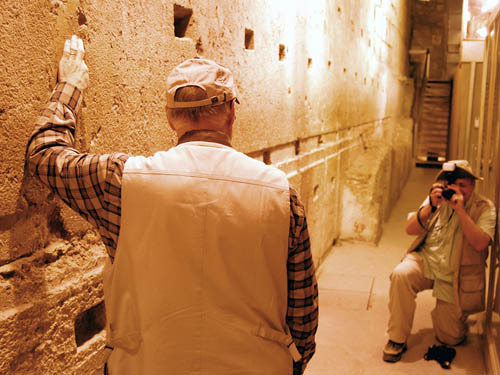 Most first time visitors to the Western Wall in Jerusalem, whether in 1967 or 2009, probably think they are looking at a wall seen by Jesus and other first century characters prior to AD 70. In a sense they are. That is, they are seeing the same wall, but not at the first century level. The Western Wall is the western side of the temple platform enclosure built by Herod the Great. Jesus drove money changers out of the temple precinct (hieron) (John 2:13-17). In their discussion with Jesus the Jews called attention to the length of time the temple (naos) had been under construction (John 2:19-21). The photo below shows the largest visible stone in the western side of the Temple precinct. According to the Western Wall Tunnel web site, this stone is the largest one in the tunnel. It is 41 feet long, 11.5 feet high, and 15 feet deep. The web site says that this stone is 20 feet above the street level of the first century. The largest visible stone in the Western Wall tunnel. Photo by Ferrell Jenkins. The Tunnel was dug in the years following 1967, but an exit was not cut on the north end until 1996. Israel National News reports, in an article by Samuel Sokol, plans to conduct a archaeological dig under the Western Wall in Jerusalem. The complete article may be read here, and another here from The Jerusalem Post. This drawing shows the planned part underneath the present pavement at the Western Wall. Proposed Western Wall archaeological park. Photo: Antiquities Authority. Here is the way this area looks at the present time. The Western Wall platform. View to north toward Wilson's Arch. Photo by F. Jenkins. Such a race as that which forms the substance of Paul’s figure is described well in Ben HUR. The charioteer stood on a tiny platform over sturdy wheels and axle. His knees were pressed against the curved rail, and his thighs flexed. He bent forward at the waist, stretching out hands and head over the horses’ backs. This is surely what he means by ’stretching out to the things before’. The reins were wound round the body, and braced on the reins the body formed a taut spring. It can easily be seen how completely the charioteer was at the mercy of his team’s sure feet and his own fine driving skill. Euripides, in his Hippolytus, tells how the hero fell and was killed in such conditions. Ovid describes the same disaster in Book XV of his Metamorphoses. In his intense preoccupation the driver dare not cast a glance at ‘the things behind’. The roaring crowd, crying praise or blame, the racing of his rivals, all else had perforce to be forgotten. One object only could fill the driver’s eye, the point to which he drove at the end of each lap. 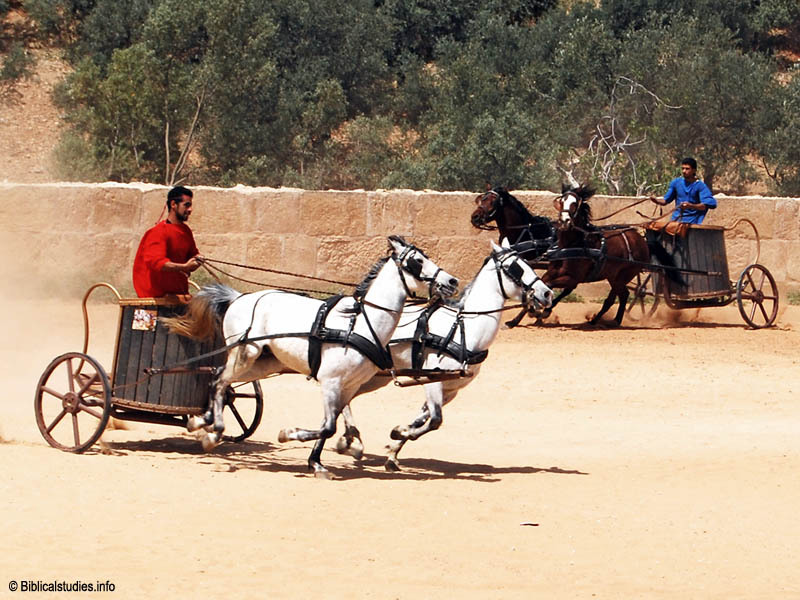 Chariot race at the RACE show in Jerash, Jordan. Photo by Ferrell Jenkins. This is a reprint from April 30, 2008, but with a different photo suitable for use in presentations. Click on the image for the larger photo.